With the Nintendo Switch continuing to be something of an RPG powerhouse, thanks to the recent releases of Ys VIII: Lacrimosa of DANA and Octopath, RPGs can come in many forms and that latest to hit Switch, is none other Fernz Gate. Having actually originally released in the very same year as Antiquia Lost, Fernz Gate shares a lot of similarities with it, in the sense of feel, implemented mechanics and assets, but don’t worry, there is plenty of new content and features at work. Although, things like the Shop feature where you can secure special items and weapons via a special currency you can collect in-game, is still present and so is the means to plant seeds and grow them for stat-boosting fruit. 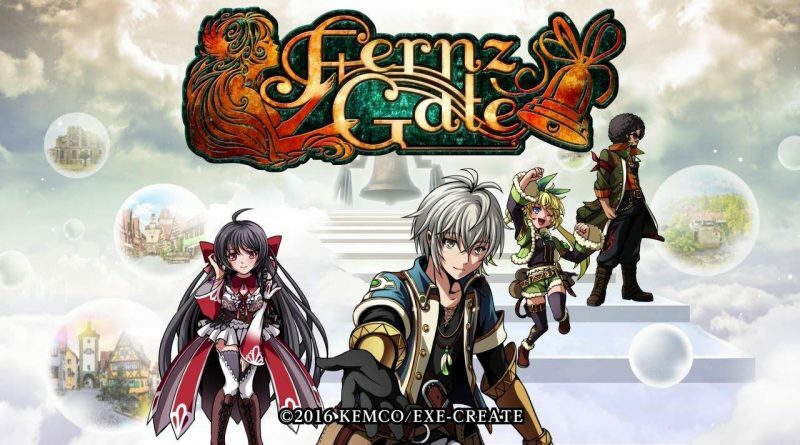 Still, just because Fernz Gate is visually similar to Antiqua Lost, it’s not so much as a bad thing, since 16-bit graphics are still something that is appreciated in this day and age, but if you’re fresh from coming off Octopath Traveler and looking to play another RPG, there is a very high chance that Fernz Gate will look an unappealing. Especially when the presentation of the game’s menus aren’t as nice as seen in other EXE-CREATE titles. If however, you are able to remove the Octopath googles, what you can expect to find with Fernz Gate, is a game about many characters (4 of which are playable,) and a faraway land called Fernland. Once a peaceful land where nothing happened, Fernland made a name for itself as being crossroads for wanderers from other worlds, can venture to and rest for as long as they need to, before passing on. Only one day, the wrong kind of wanderer turned up and discovering the kind of power he could wield in Fernland, the Ganondorf-looking wanderer named “Clangorrah” desired to become the Overlord to Fernland and would stop at nothing to achieve his goal. Not even the nameless Goddess, who presided over Fernland could stop him and before she knew it, he would take her mana and the mana of all Outlanders, should they pose a sufficient amount. The ones that didn’t would then be killed, or suffer a fate worse than death. Where there is bad though, there is always good, at least in video games, comics, stories, films and TV shows and in Fernz Gate, good comes in many forms and all of them are travellers from other worlds. One form in particular, is Alex, a 17 year old schoolboy that comes from a world where he was able to live a peaceful existence. Alex has no idea how he turns up in Fernland but it’s thanks to him we get to meet the 14 year old Toril, who grew up in a hostile world and had to learn to fight at an early age. Then after Toril comes Lita, another 17 year old from a peaceful world and actually spent the majority of her life, living in a hospital with only her family and hospital staff being her company, due to never having friends. There’s also Kodan, an Outworlder from a land besieged by dragons, only he’s not alone for he has a companion in the form of the female Vibachi, who lives in his afro. Together, Alex, Toril, Lita, Kodan and Vibanchi, make for an odd grouping of characters, but then it’s not a true RPG if the main cast of characters were all your average Joe and Jane. With a great deal of reluctance and some character growth, thanks to bonding, this motley crew will soon find themselves faced with a quest of the utmost importance, which they don’t have to undertake alone, as all mana wielding Outlanders are all happy enough to take the fight to the Overlord, be it as a serving member of the Resistance, or a member of the Support Squad. Now, there is a great deal more I could say with regards to the story and characters, but even though as a game that is 2 years old, with plenty of information available online, there is actually a lot we can’t say due to encroaching spoiler territory. But something we can say, since it is something that ties into the story and things to do, is that the Maids are back! Having been introduced to the organisation known as the Maid Association, in Antiquia Lost, in Fernz Gate the organisation is the Maid Co-op and yes the Curies are back. Both Maidame and Jolie Curie may have a different look about them, but Maidame Curie is still the all-powerful Maid who knows how to get the job done, keep everything in check and punish all who put a toe out of line, including her own sister. Her cruelty aside, if not for her and her organisation, Franz Gate would not have a cool Arena mode for players to play through, with 4 available cups, each consisting of 3 battles. Not only can some Rare items be earned via clearing these matches, but so can Maid Coins that can then be used for exchanging for all manner of items, weapons, clothing items and Rings, including those that can release Buddies. Only these Buddies are extra special as one of them is Jade, 1 of the 4 protagonists form Antiquia Lost. By no means is that all the Maid Co-op is good for, but we can talk about its other uses later, as most of it is post-game content anyway. So, in keeping with most EXE-CREATE RPG’s and most turn-based PRG’s in general, the majority of the gameplay, is in the battles and battle preparations. While being able to hold your own in a fight is one thing, preparation is half the battle, so with plenty of chests to be found, shops to spend gold and sub-quests to be completed, getting new equipment is an easy task and you should make it a priority to equip the strongest thing for each character and there is a short-cut for doing so. For things like equipping Rings that allow you to deal more damage, use elemental attacks and more, you will need to personally equip them and if you happen to have a particular weapon you like to use, due to its attributes, you can strengthen it by customising it. As for battling, the majority of it is the same old, same old. You have your skills, your common attacks, items that can be used, Brave Arts and when you’ve advanced fair enough into the game, you can use Shared Arts too. There’s also Buddies, secondary characters that can be taken into battle with you, and assigned to your 3 main fighters. Don’t let the 3 fighters thing discourage you though, as just because you choose to main with Alex, Lita and Kodan, it doesn’t mean Toril needs to miss out, as she can also be assigned as a Buddy and she can also reap the rewards of levelling up via battling and so can your Buddies. It’s worth pointing out that Buddies do come in different shape and sizes, so it’s always good to try playing with each one a couple of times, to see which ones serve your battle style better. Also, since it is possible to get multiple rings for the same Buddy, the first time you use it will release them, whereas using a specific ring after that will actually help them level up by 5 levels. Although you can also level them up by dispatching them to undergo missions, which will also earn more Maid Coins. Still, just because you have everything going for you, it doesn’t mean you will still win every battle, especially in Expert mode, so if things are too hard, you can change the difficulty at any time and battles can be made faster by enabling auto-battle at the start of each fight. Moving onto the actual exploration, exploring towns and dungeons is pretty much the same in any other RPG by EXE-CREATE, as there are NPCs to interactive with, chests to open, secret paths to uncover and areas to explore. Except in Franz Gate, there are also things called Curios, that can be discovered in dungeons and used to increase or decrease battles being triggered. You can also use them to call forth enemies to engage in three battles, one straight after the other, for more goodies. You’ll also never have to worry about recovering between battles either as things like HP, recover immediately. Another aspect in how Franz Gate differs to a lot of its sister games, is in the fact it does away with an overworld and instead has a hub world, in the form of maps that show you all the places you can go to, with more being unlocked as you proceed. Oh and for what it’s worth, if you are desperate to get to the end as soon as possible, you can do it all in less than 12 hours but you will not fully complete the game in that time and nor will you experience the true end. For the true end, you will actually need to beat the boss, save the game when prompted to and load the save. A new turn of events will unfold, a new dungeon will become available and an even harder boss battle awaits, but even then that’s not it. Just because opening every single chest might not interest you, there is another place you can visit and I’m not talking about the Metal Region. While it is questionable to even release a 2D RPG so soon after Octopath Traveler, by no means is Fernz Gate a bad game. Its story might be a bit weak and it features a lot of dialogue that drags on, but there is plenty of content, some enemy variety and enough difference to make it worth playing, even if you have played every other game developed by EXE-CREATE.